Boracay Island, Philippines – All Star DeMar DeRozan’s first game as a Spur started slow, but ended well, as the San Antonio Spurs eked out a 112-108 victory over the visiting Minnesota Timberwolves at the jam-packed AT&T Center in San Antonio, Texas, home of the Spurs, Wednesday night (Thursday morning, Philippine time). DeRozan finished with a game high 28 points on a 10 of 21 field goal shooting, to go along with 4 boards and 4 dimes across his name. Fellow All Star LaMarcus Aldridge overcame a horrible shooting efficiency to still end up with a monster double-double performance of 21 points and 19 rebounds – 8 of which on the offensive end, including 2 assists, 1 steal and 3 blocks to dominate his counterpart Karl-Anthony Towns, who was limited to a measly 8 points, 9 boards and 3 assists before fouling out. Veteran forward Rudy Gay was also steady for the Spurs with his 18 points on an 8 of 12 field goal shooting and 7 rebounds. All but one of the players fielded in by Spurs head coach Gregg Popovich contributed on the points department. 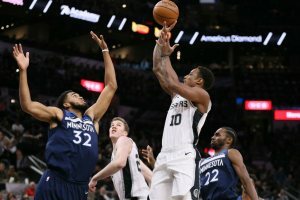 The Timberwolves’ guard-wing rotation was very productive with Jeff Teague, Andrew Wiggins, and Jimmy Butler contributing 27, 20, and 23 points, respectively, but the starting frontline of Karl-Anthony Towns and Taj Gibson only finished with a combined 14 points for Minnesota head coach Tom Thibodeau. Sharpshooting big man Davis Bertans provided a much-needed spark off-the-bench with three timely bombs from the rainbow territory to help the Spurs gain cushion down the stretch. Comments are highly appreciated. You may send them to reylanloberternos@yahoo.com.ph and you may follow @reylan_l on twitter. Click here to view a list of other articles written by Reylan Loberternos.